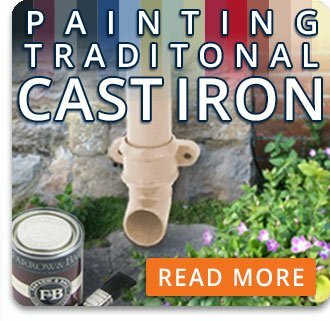 Download a 'list' pricelist (prices before discounts), installation guide, 'Painted or Primed Cast Iron - Which should you choose?' leaflet, and to see case studies on our Downloads Page . A complete range of cast iron half round gutter & fittings in both primed & black pre painted finishes. A complete range of cast iron beaded half round gutter & fittings in both primed & black pre-painted finishes. A complete range of cast iron victorian ogee gutter & fittings in both primed & black pre painted finishes. A complete range of cast iron moulded ogee gutter & fittings in both primed & black pre painted finishes. A complete range of cast iron Round & Square downpipes & fittings in both primed & black pre painted finishes. Accessories for fitting cast iron gutter & downpipes.